Receive Instant Video Access and E-Mail Alerts of "BARGAIN" Rehab & Turn-Key Rental Homes No One Knows About! Thank you for visiting RehabVault.com . If you are looking for true wholesale deals in the York PA area… then you have come to the right site! I am a real estate wholesaler and offer properties to you at tremendous discounts. The deals I offer will NOT be found anywhere else. These are my deals and I'm looking to assign them for a quick, modest profit and move on. I'm constantly acquiring bargain-priced properties that are perfect for rehabbing...or to add to your rental portfolio. If you'd like to receive instant access to the property I'm selling right now and priority e-mail notifications of wholesale deals in the future, please enter your contact information in the box to the right. Please note, I will use every method to get in contact with you so please provide me complete information so you don't miss out. These bargain deals go pretty quick so please look out for my email. PS. All my properties are offered at very deep discounts, and as such sell very fast so please be prepared to act fast when you receive an e-mail alert from me. PPS. I'm also the only wholesaler willing to put my money where my mouth is by offering you a "30% FREE Equity GUARANTEE on every Fixer-Upper Property or I pay you $1,000!" No one else has the ball$ to offer you this. I'm the only one and I stick by this guarantee everday! YES...I want instant VIDEO access to your "Bargain Real Estate" deal and would like PRIORITY NOTIFICATION of ALL your future real estate deals too! 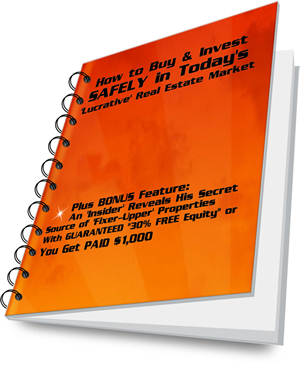 Take Action Now and also get access to a FREE Report titled "How to Buy and Invest Safely in today's Real Estate Market"
Your Privacy is Important to us and your information will never be shared. We hate SPAM as much as you and you can always unsubscribe!